The Copeland Papers are a rich collection of personal and professional correspondence, journals and writings from Copeland's Yale years, manuscripts, typescripts, notes, and draft revisions of his works on Edmund Burke, and a journal chronicling Copeland's four-year exercise in the daily practice of writing. An eminent scholar of the political philosopher Edmund Burke, Thomas W. Copeland was born in Shaker Heights, Ohio, on July 10, 1907, the youngest of two sons of the attorney Mark Anson Copeland and Louise Wellsted. Distinguishing himself during his undergraduate years at Yale (AB 1928), Copeland spent a year sidelined in study at Harvard Law School before returning to Yale to pursue a doctorate in English literature. It was during his third year in the program that he discovered Burke, who would become the subject of his dissertation, Burke and Dodsley's Annual Register (1933), and the focus of his scholarly life for the next five decades. 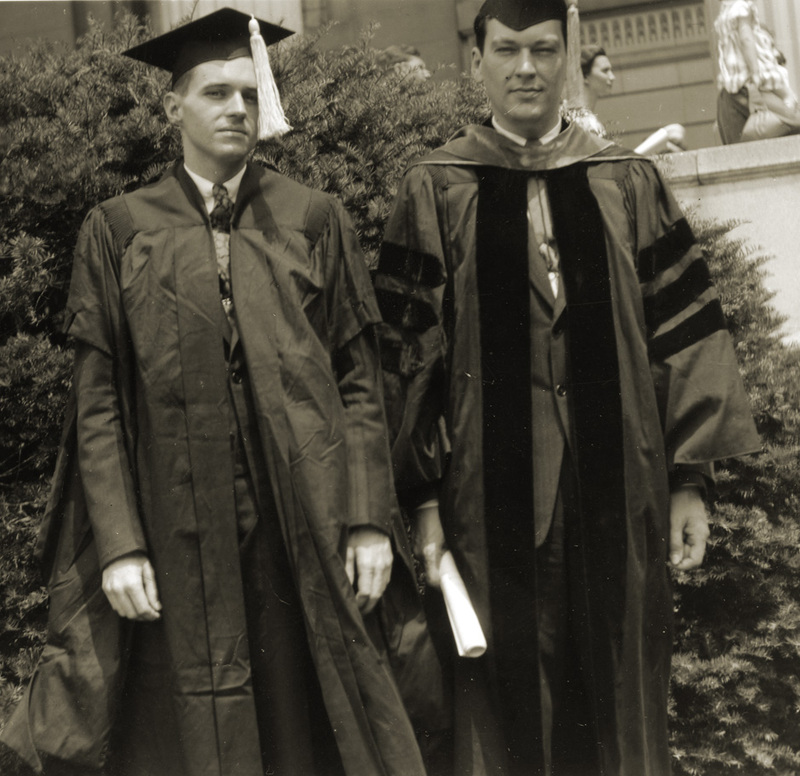 In the Depression's slim job market, Copeland took an Instructor's appointment at Cornell, but he was called back the next year to his alma mater, serving as Instructor (1934-1940) and then Assistant Professor (1940-1949). During the Second World War, he was commissioned in the Navy reserves, retiring in 1945 with the rank of Lieutenant Commander, moving to the University of Chicago in 1949. The timing of the appearance of Copeland's first monograph -- a much-amplified version of his dissertation, Our Eminent Friend Edmund Burke (New Haven, 1949) -- proved to be fortuitous. As his reputation rose as an authority on Burke, Eric Spencer Wentworth-Fitzwilliam, the ninth Earl Fitzwilliam, agreed to deposit the papers housed at the family's Yorkshire estate, Wentworth Woodhouse, at the Sheffield Central Library, including the bulk of Burke's correspondence. Copeland became a leader of a multi-national editorial team devoted to the massive collection, issuing the Checklist of the Correspondence of Edmund Burke in 1955 and the first of ten volumes of the Correspondence of Edmund Burke in 1958. Devoted himself to his scholarship, Copeland split his time -- and salary -- evenly between Chicago and Sheffield for several years. He came to UMass in 1957 as part of a small wave of academic hires designed to strengthen the humanities, recommended by his close friend from graduate school days and faculty member at UMass, Maxwell Goldberg. He continued his practice of alternating years in Sheffield, and while in Amherst, he devoted about one third of his time to the editorial. Despite splitting his time, he became well known on campus for his wit and sharp memory, and he was often described with the words civilized, erudite, scholarly, and unpretentious. In 1961, in recognition of his scholarly distinction, he was selected to become one of the first faculty members to be designated Commonwealth Professor. Twice a recipient of a Guggenheim Fellowship, he was recognized with honorary doctorates from Burke's alma mater, Trinity College, Dublin, and the University of Sheffield. Although Copeland formally retired in 1976, he continued in his scholarly pursuits and was completing an edition of the correspondence of Burke and Boswell when he died unexpectedly at Cooley Dickinson Hospital in Northampton on Jan. 28, 1979. He was commemorated with a named professorship, the Thomas W. Copeland Professor of English, which was filled by his friend and colleague Arthur Kinney. Like most of his academic career, the Copeland Papers are centered on five decades of study of the eighteenth century statesman and political philosopher Edmund Burke. Volumetrically, the largest portion of the collection is comprised of drafts of Copeland's publications on Burke, but the collection includes significant correspondence relating to his editorial work and scholarly connections, as well as some amusing and occasionally fascinating letters and a journal written while an undergraduate at Yale. The papers are organized into four series: Personal material, Correspondence, Professional records, and Writings. Biographical and bibliographical material, family correspondence, journals and writings while a student at Yale. Correspondence with family members, primarily his brother Mark and sister Margaret; UMass faculty members; members of the "Burke factory" in Sheffield, England, where the multi-volume Correspondence of Edmund Burke was produced; and other colleagues and friends. Complete names for many correspondents are difficult to determine and a large proportion of the letters are undated. Material on Copeland's professional appointments at Yale and UMass, on scholarly organizations and activities in the U.S. and in England, and a journal (1973-1976) that was an exercise at keeping his hand in at writing. Manuscripts, typescripts, voluminous notes and revisions, plans and funding, some correspondence, and lists of Edmund Burke materials (mostly at Sheffield Public Library in England). All are arranged in subseries under the titles of the various works about Edmund Burke. The titles are listed in chronological order beginning with Copeland's dissertation on Burke in 1933 through Portrait of Burke which was to be published in 1987 from these papers, edited by Elizabeth Lambert. A grant application by Lambert contains background information, and descriptions of the editing task and of Copeland's study of Burke scholarship. A letter from Valerie Jobling, Assistant at the "factory", sheds light on the bulk of Burke project materials which were retained in England. A clipping from a Sheffield Library report indicates that all photocopies and microfilm used in the course of the project would be retained there. "On Reading the Classics of Literature"
"Swift and the Satiric View of Politics"
Smith, Robert A., "Burke's Use of History"
William Burke (213 p. book) poetry, essays, etc. Acquired from Mrs. Chads O. Skinner, 1981. Processed by Virginia Conrad, 1987. Cite as: Thomas W. Copeland Papers (FS 050). Special Collections and University Archives, University of Massachusetts Amherst Libraries.